The Virotyp is one of the great oddest machines in early typewriter history. Odder still is that it was a commercial success in the brief period that it was sold. The Virotyp was developed by French engineer H. Viry, who wanted to develop a machine that could be used in the trenches of World War I, or even on horseback. His initial model was small enough to keep in your hand and actually write on horseback (see pictures 5 and 6). 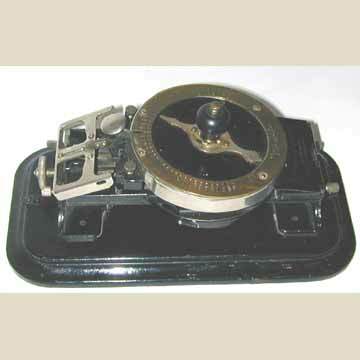 The typist would stick his little finger of the right hand through the leather strap and use the thumb and index finger of the same hand to twist the knob and select the letter. The index and middle fingers of the left would hold the machine on the left, while the thumb pressed the key to print. As it printed, the guide rail that also held the paper would move one space to the left. The machine contained a full set of lead type and inking was done by two small rollers.